Nowadays we are used to having games available right in the palm of our hands at anytime given. But before we had the smartphone – we ventured to the arcade – were the latest and greatest video games were on display like electromagnetic rainbows. But, what kind of fun was available for kids growing up in the 1950s and 1960s? Enter the Wonderland arcade. Located at the corner of 12th and Grand in Kansas City. The Wonderland Arcade was a popular haunt for people of all ages with pockets full of nickels. 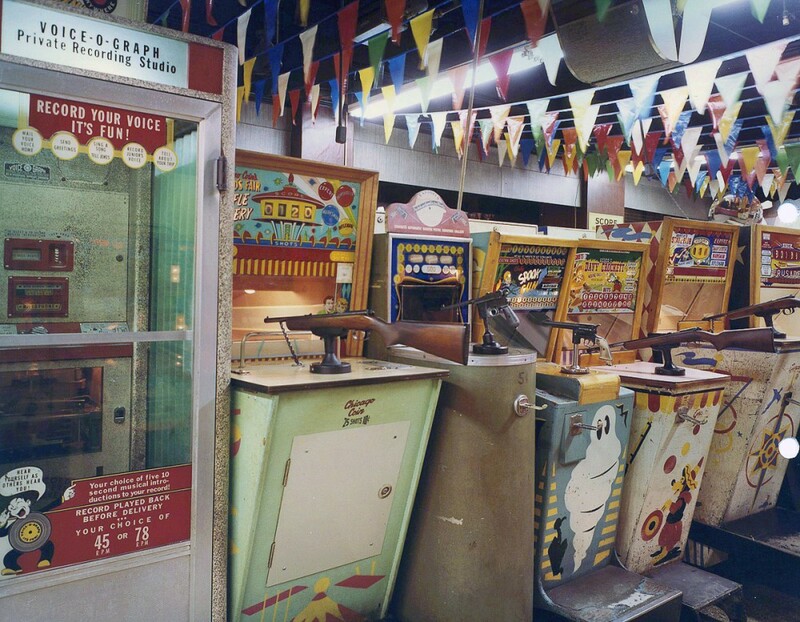 Here you could not only play the newest redemption games, fortune tellers and pinball machines – there was also a small diner type cafeteria inside where you could get warm and cold refreshments, along with hamburgers and hot dogs. In other words, the perfect place to kill time. Wonderland brought in a lot of revenue. So much, that in 1947, it was robbed by a 13-year-old who made off with $150. He was however caught by police shortly, after going on a spending spree, were he bought a new suit and shoes for him self (which 13-year old doesn’t want that??) and paying everything with nickels. Below is a batch of photos from this magical place taken circa 1968 (and no, those aren’t Instagram filters, for anyone reading this who is under 25). And for anyone who’s curious what the building at Grand Blvd and 12th Street looks like today, here’s a street view from Google. Which place did you kill time at when growing up?